Darryl Myers, Eureka Van & Storage Co., Inc., Herndon, Va., earned Wheaton’s Permanent Fleet Driver of the Month award. Darryl has more than 20 years of experience as a professional household goods driver. This is his second Driver of the Month award. 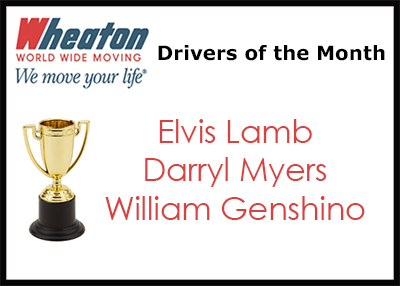 William Genshino, Mather Brothers Moving Company, Garner, N.C., earned Wheaton’s Intermittent Fleet Driver of the Month award. Bill has more than 24 years of experience as a professional mover. This is his fifth Driver of the Month award.